A few weeks ago, I got up early and went to stand at the box office to get tickets for a concert. No, it was not to see Billy Joel, Five For Fighting or Bon Jovi. These tickets were for a family event. Once again, we are going to see The Wiggles!! We are huge fans of The Wiggles. We have been watching them for over five years now. We have not only been to two concerts, but last year we sat in the front row of the show. This year, we are taking the newest Wiggles addict in our family. JSL will finally be able to see The Wiggles live and he has no clue what to expect. He has only seen the show at Wiggles World in the Six Flags park near us. Of course, NHL grew up watching The Wiggles on Playhouse Disney. 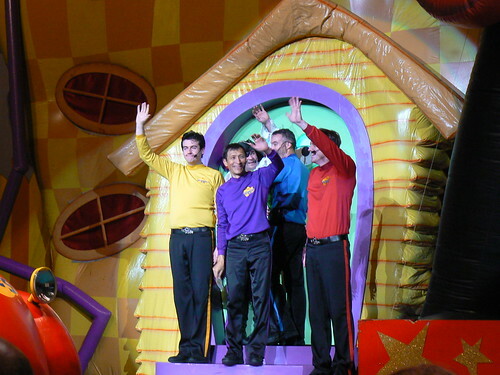 Did you know that The Wiggles have a new television home in the United States? Not only are The Wiggles on Sprout, but they have a new show that is on weekday mornings from 6-9 on Sprout. Sadly, our cable company (Time Warner) does not provide us with Sprout. We have been asking for it for many years now, but still have not been able to get it. Of course, with The Wiggles move to Sprout I am once again starting my crusade to get this cable station added in our area. I not only went to WigglesPlease.com, I am also planning to call my Time Warner Cable to make the request again. When I was asked by Family Review Network to help to get the word out about The Wiggles moving to Sprout I jumped at the opportunity. We were also told about Sprout being on Facebook. If you are on Facebook head on over to check out the Wigglemania Facebook Contest. In addition to helping to get the word out about The Wiggles new television home, we were also sent a DVD to review. When the DVD arrived my little Wiggles fans were eager to check it out. We received The Wiggles Present: Dorothy The Dinosaur. As you can see, we are no strangers to Wiggles DVDs. The Wiggles Presents: Dorothy the Dinosaur is different from other Wiggles DVDs that we own. This DVD takes us to Rosy Town where we meet up with Dorothy the Dinosaur. Dorothy begins by showing us her book that is filled with some of her wonderful memories. As she turns the pages of her memory book we are transported into her past. We get to sing and dance along with Dorothy, Wags the Dog, Henry the Octapus, Captain Feathersword and special guests that include Francis Awaritefe, Rachel Beck, Troy Cassar-Daley, Kathy Gothadjaka, David Hobson, Jane Kennedy, John Rowe, Leo Sayer and Don Spencer. NHL (6): He liked the songs that were included. He immediately got up and danced along with Dorothy. When the DVD was over he asked where Sam, Anthony, Murray and Jeff were. Being older he is used to the more traditional Wiggles DVDs where they are front and center in the production. JSL (2): As a newer Wiggles addict fan, the little guy asked to watch it again when it was over. He loved dancing and singing along to several songs that he recognized. After watching it a few times he now sings along with everything and especially love the song featuring Leo Sayer who is also in the You Make Me Feel Like Dancing DVD that we already owned. Parent View: We could appreciate the brave move to try something different. Putting the spotlight onto Dorothy and seeing her memories in song/dance was a nice change. As always, we love the educational push that all Wiggles DVDs have in them. There is a lot for children of all ages to learn from watching this DVD. There is no doubt that our Wiggles DVD collection will continue to grow. Look for new Wiggles concert photos coming in about a month when we take JSL to his first live Wiggles event with Sam, Anthony, Murray, Jeff, Captain Feathersword, The Wiggle Dancers, Dorothy, Henry and Wags. 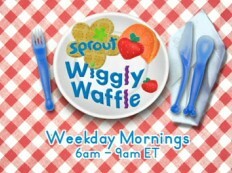 If you have Sprout, know that we are extremely jealous of you and please be sure to tune in and watch Wiggly Waffle each weekday morning. 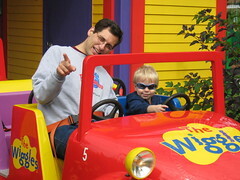 For now the boys and I will continue to watch our Wiggles DVD collection and play on The Wiggles area on Sprout Online. Disclosure: This post was written as part of a program for Family Review Network and Sprout Television, who provided the DVD for review. Hee hee! Your husband looks as though he could be a Wiggle! We’re not familiar with them, but they look fun. .-= Holly at Tropic of Mom´s last blog ..Medicine microwave =-.